My entire life I’ve never been satisfied with the vast majority of answers I was ever given on traditional spiritual matters, much less anything beyond the superficial norm. Questions that were answered usually just created more questions with equally unsatisfying results. Answers that many seem to accept at face value I never have accepted: I have this buzzer that goes off in my head when something isn’t right, and though I cannot always put my finger on it in the moment, I am keenly aware of it. I have always had it. Many of my questions were prompted by my own experiences, which made me curious, but were made all the more puzzling because most of the time no one knew what I was talking about, and thus usually attempted to explain things away with whatever superficial answers they seemed to think I would accept. Since I could not find real answers about the nature of God and spiritual reality in conventional channels I went looking for answers anywhere I could find them. I studied all of the things that are considered esoteric, unconventional, and anything orthodox religions have gone out of their way to brand as forbidden. The deeper I dug and studied, the more consistently certain kinds of patterns started to clarify and emerge from the underlying matrix of information. Dots connected in ways that I never would have thought or expected, and the picture that has resulted from the lines created, and testing experimental hypotheses, has led to further experiences of a certain kind of knowledge (gnosis) that is not easy to articulate… though, obviously I have accepted it as a task to do so. I did not know the labels until later in life, but my inclination was towards direct experience rather than accepting dogmatic indoctrination. 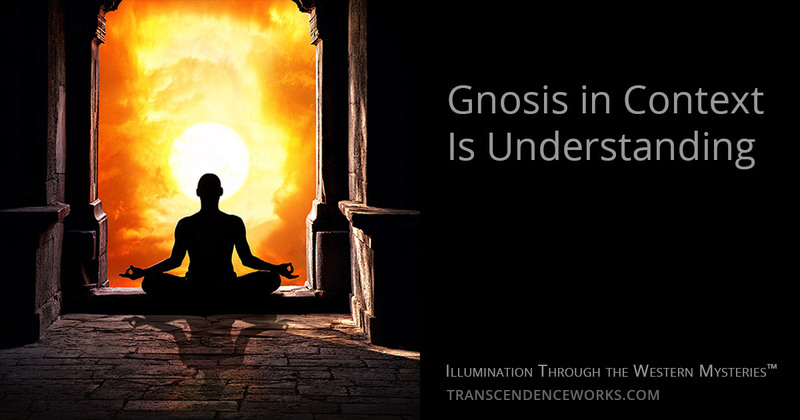 This idea, called ‘gnosis’ in Greek, is a form of knowing that relates to having personal, direct experience of a higher/alternate level than what is normally perceived as consensus reality. Direct experience removes the need to ‘believe’ because one knows. In that distinction, believing can then be seen as something that has been accepted as true without really knowing. The caveat of the ‘gnosis’ path is that having direct experiences of higher reality and reaching a certain kind of knowing is not the same as Understanding. In order to Understand one’s experiences, it is necessary to have an accurate context in which to place them so those experiences lead progressively to holism and Illumination rather than false epiphanies, inflated egotism, and an increasingly fractured consciousness. This is the capstone that many are missing, the key which allows the tumble locks to open the Way. It is also nearly impossible to come by this point of view without some kind of adept teaching that connects the dots, fills the gaps, and allows the picture you’ve been seeking to be seen coherently. It is the grounded pursuit of this ‘context’ that I’ve spent 25 years pursuing: One facet here, one facet there, sifting through the complex trail of a seemingly endless labyrinth, collecting facets one at a time until a sparkling, beautiful jewel emerged. This jewel cannot be seen or worn, it is carried deep within; It cannot be worn like bling, though at times its light can be perceived. It cannot be stolen, or lost. It is the Pearl of Great Price that cannot be bought. I freely admit that I cannot give this jewel to anyone, it must be attained individually. Yet I can share what I have learned to the extent that I am able, so that for those Seeking to walk this path, their journeys may be slightly less circuitous than mine. All are in the hands of their higher Spirit, but we each have our part to play as we come into alignment with our purpose. This is me, doing my humble best to do what is given me to do.